The use of biomimetic approaches toward the production of nonsolid yet functional architectures holds potential for the emergence of novel device concepts. Gels, in particular those obtained via self-assembly of π-conjugated molecules, are dynamic materials possessing unique (opto)electronic properties. Their adaptive nature imparts unprecedented responsivity to various stimuli. Hitherto, a viable device platform to electrically probe in situ a sol–gel transition is still lacking. Here we describe the fabrication of a sub-micrometer electrodic cavity, which enables low-voltage electrical operation of π-gels. 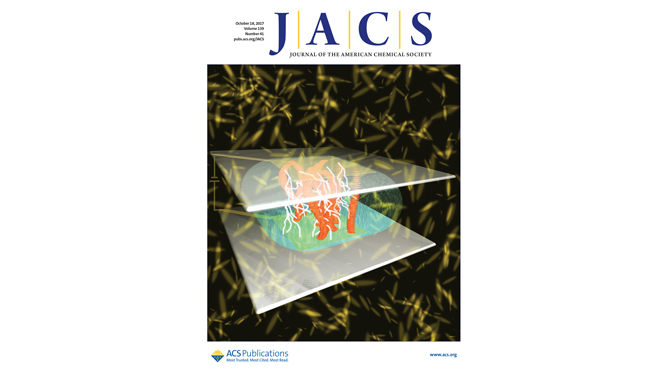 Thanks to the in situ supramolecular self-assembly of the π-gelator occurring within the cavity, we conceived a novel gel-based memristor whose sol–gel transition is reversible and can be controlled via heating and dc bias. This work opens perspectives toward the fabrication of a novel generation of nonsolid multiresponsive devices.